I’m so happy you’ve joined me today and even more excited to be on the Newton’s Nook Designs blog sharing a simple and elegant heat embossed wedding card! 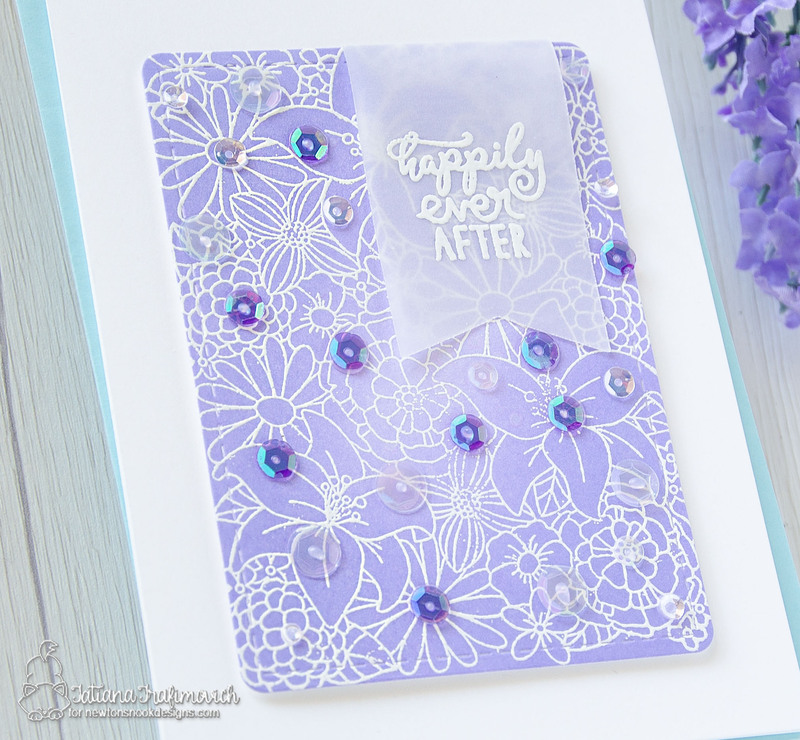 I’m playing with amazing big flower Blooming Botanicals and Wedding Frills stamp sets. For the layout I made some die cutting with Frames & Flags Die Set. To start, I inked a piece of Neenah Solar White cardstock with Hydrangea Dye ink from Simon Says Stamp using Picked Fence Life Changing Blender Brushes. Next I heat embossed large background using Blooming Botanicals stamp and VersaMark ink. It’s a great way to get more use out of such big stamps. You can achieve beautiful piece in no time at all and there’s no need to color every single flower. The stitched frame and a flag piece used for the layout come from Frames & Flags Die Set. Finally the sentiment was added from Wedding Frills stamp set and the whole piece was embellished with lots of tone on tone sequins adhered with Multi Medium Matte glue since it dries clear. Hope this project will inspire you to get another look on the big stamps you have in your stash! As always thanks so much for stopping by! Hello and welcome to Day 4 of our SugarPea Designs April Product Release! 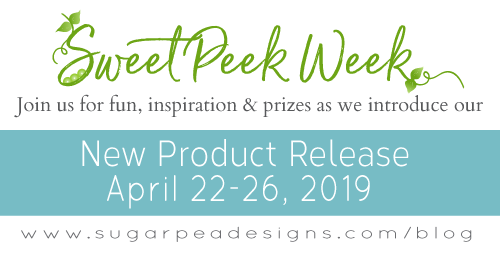 I hope you’ll join SPD Design Team over the next 2 days because we’ll be sharing Sweet Peeks for the products that will be available for purchase starting this Friday, April 26th at 6 PM EST in the SPD Store. Each day will be full of inspiration, and as always, you’ll have a shot at winning one of FIVE GIVEAWAYS! All you need to do is leave a comment for your chance to win. 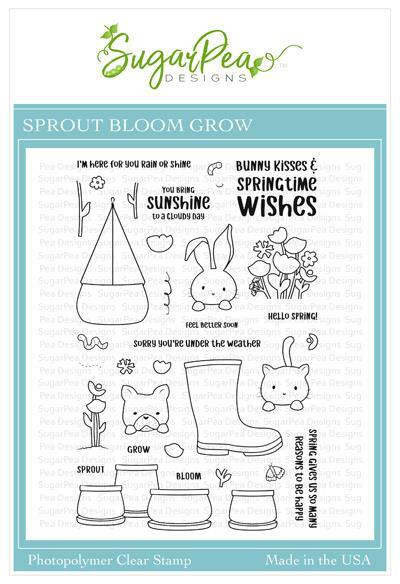 Today’s Introductions include… super adorable Sprout Bloom Grow stamp set and the coordinating Sprout Bloom Grow SugarCuts. And here’s my cute bunny card perfect for every spring occasion! Today I switched to a hot pressed watercolor paper from Fabriano since I was going to use regular watercolor and needed a medium that holds water well. 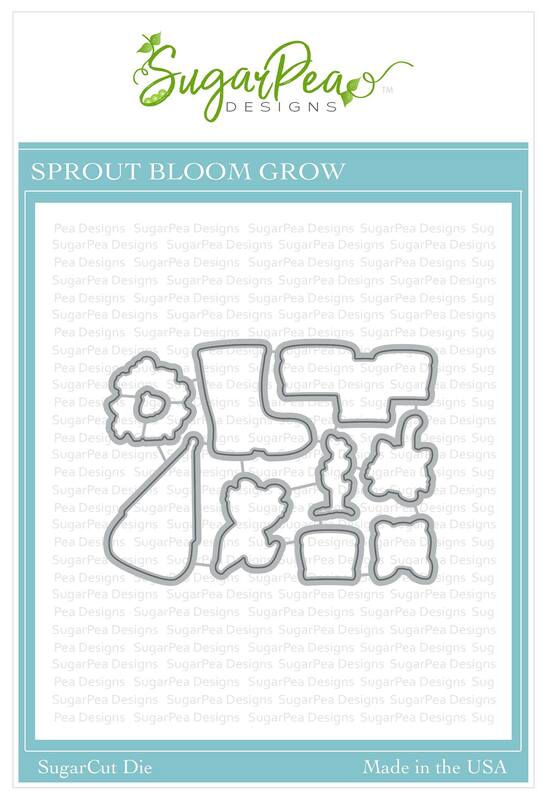 To start, I prepared all the die cut pieces using Sprout Bloom Grow SugarCuts and then stamped the coordinating outline images from Sprout Bloom Grow stamp set helping my self with the negative parts of the dies for a perfect alignment. I used VersaFine Onyx Black ink for stamping since it’s waterproof and finally colored all the elements with regular watercolors. The layout was created with just released Card Front Element Builder II set. I die cut a white dotted full card front rectangle and a matching tag from Spots & Stripes Bright paper pad along with a few fishtail banners. Assembling all the elements I used foam tape for a bit of dimension and interest and a few matching sequins. Would you like to win the Sprout Bloom Grow? Leave a comment below. You have all week to comment! 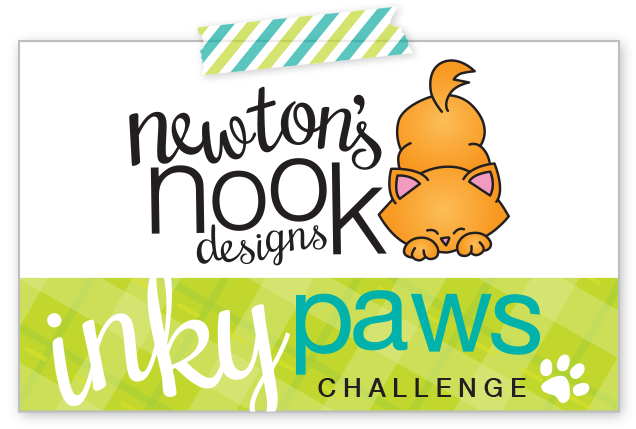 Winners will be announced on Sunday, April 28th. SPD Design Team has some amazing and creative inspiration for you using the products featured here today. 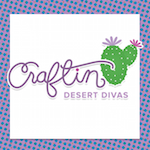 You can visit each of our designers’ blogs below for details on their projects. And while you’re there be sure to leave a sweet comment for them, giving you an extra entry to win today’s giveaway prize. That’s all for today! Hope you like these cute cards! Thanks so much for stopping by and have a great day!!! Hello and welcome to Day 3 of our SugarPea Designs April Product Release! I hope you’ll join SPD Design Team over the next 3 days because we’ll be sharing Sweet Peeks for the products that will be available for purchase starting this Friday, April 26th at 6 PM EST in the SPD Store. 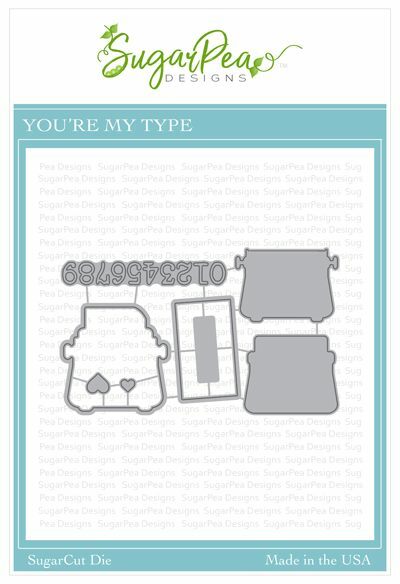 Today’s Introductions include… amazing You’re My Type stamp set and the coordinating You’re My Type SugarCuts. For my stop on this hop, I played with awesome You’re My Type SugarCuts that allow more than simply cut out the coordinating stamps. In fact, the set contains some additional pieces that can be used to build a typewriter. I was not sure on the color combo I want to use and so I die cut all the elements from Neenah Solar White paper first and then quickly colored with copic markers. I used BG0000-BG10-BG11; C4-C7 and BV01 numbers. The background was created on a dotted panel die cut from just released Card Front Element Builder II set. I ran the front part back and force into my die cutting machine making the window for the shaker part with Stucked Honeycombs and then inked inside, creating a colorful background. Before sealing the shaker window I filled it with clear sparkling sequins and some beads. 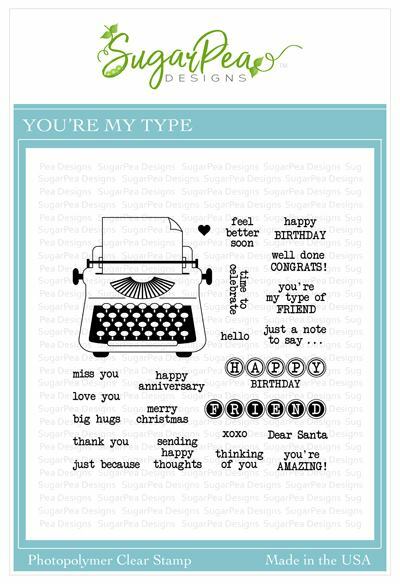 The sentiment that comes from You’re My Type stamp set was heat embossed on a strip of paper colored with the same copic markers that I used on the typewriter for a perfect match. Would you like to win the You’re My Type stamp set? Leave a comment below. Hello and welcome to Day 2 of our SugarPea Designs April Product Release! I hope you’ll join SPD Design Team over the next 4 days because we’ll be sharing Sweet Peeks for the products that will be available for purchase starting this Friday, April 26th at 6 PM EST in the SPD Store. 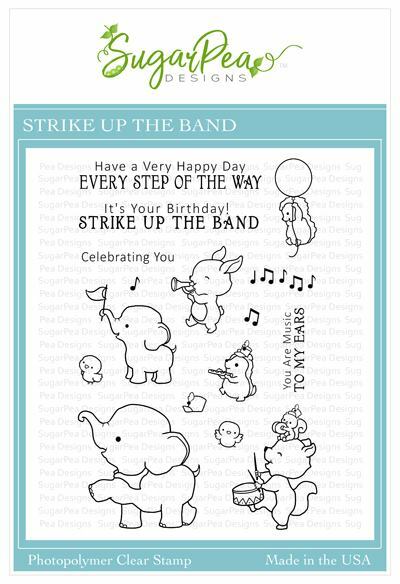 Today’s Introductions include… super cute Strike Up The Band stamp set and the coordinating Strike Up The Band SugarCuts. 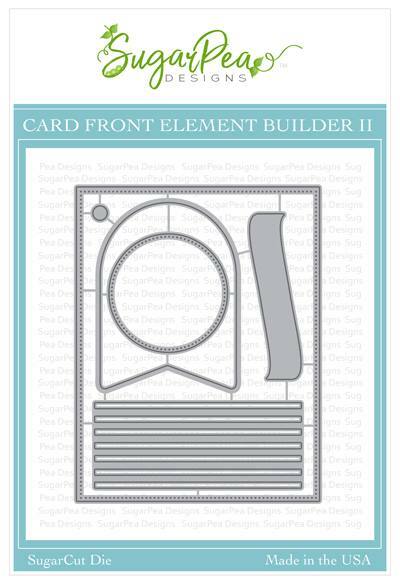 Plus wonderful and versatile Card Front Element Builder II set so useful for any layout. For my stop on this hop, I prepared a cute scene mixing some new and old products. 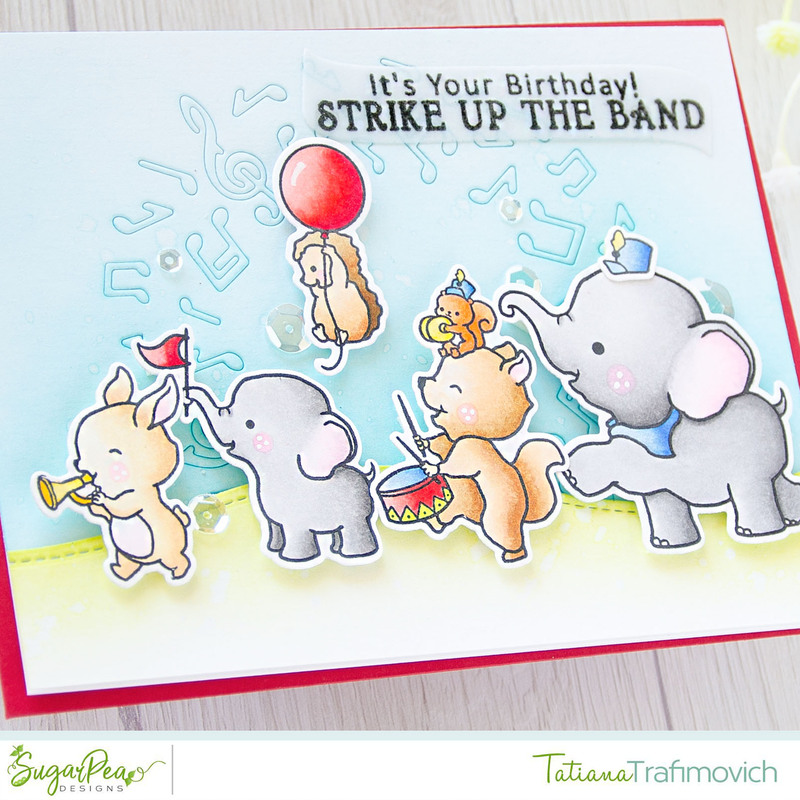 To start, I die cut some cute critters using Strike Up The Band SugarCuts from Neenah Solar White paper. Next I aligned the negative parts of the dies into my MISTI stamping tool and stamped the coordinating images from Strike Up The Band stamp set with a copic friendly black ink and as you can guess proceeded with coloring. These are all the exact color of copic markers used on this card: R21-R22-R24-R27-R29; B21-B24; E30-E31-E35-E37; YR30-Y11-Y15-Y17; T0-T1-T3-T5; YR00-YR02; RV000-RV00-RV10; YG01. The background was divided into the “grass” portion die cut with Card Front Element Builder set and inked with Twisted Citron Distress ink while the “sky” portion was embellished with Musical Cover Plate SugarCut and inked with Tumbled Glass and Peacock Feathers Distress inks. Finally for the sentiment, heat embossed on vellum, were used a banner die cut from new Card Front Element Builder II set and the same Strike Up The Band stamp set along with a few clear sequins that finished this project. 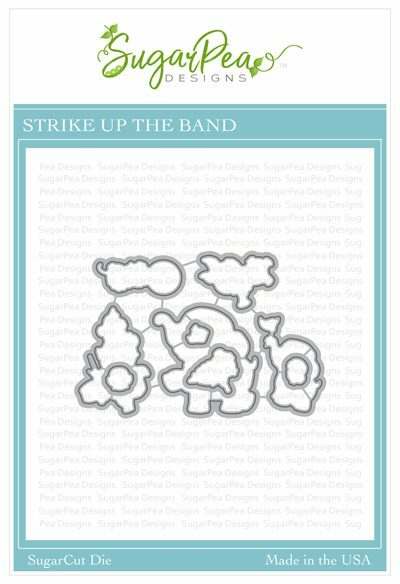 Would you like to win the Strike Up The Band stamp set? Leave a comment below. Hello and welcome to Day 1 of our SugarPea Designs April Product Release! I hope you’ll join SPD Design Team over the next 5 days because we’ll be sharing Sweet Peeks for the products that will be available for purchase starting this Friday, April 26th at 6 PM EST in the SPD Store. 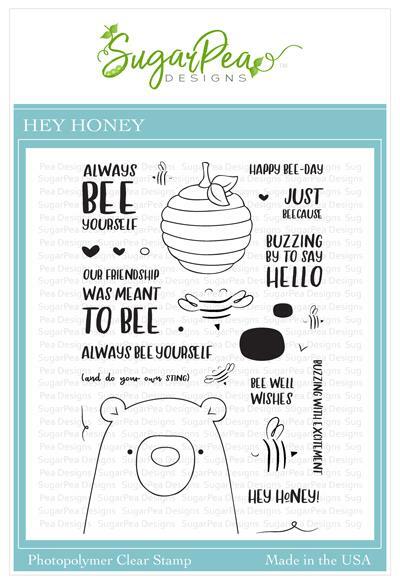 Today’s Introductions include… super adorable Hey Honey stamp set and the coordinating Hey Honey SugarCuts. 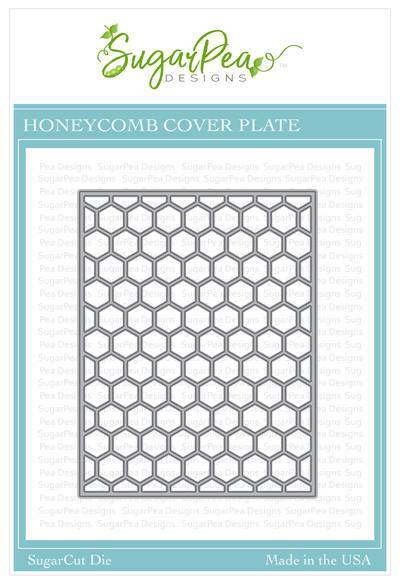 Plus two new amazing stand along dies: big full size card front Honeycomb Cover Plate and nesting Stacked Honeycombs. 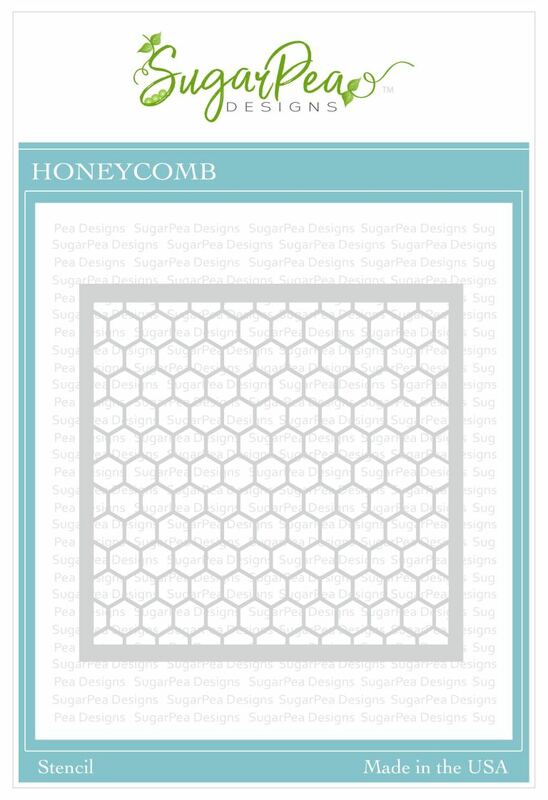 And more there’s a Honeycomb stencil as well. And here’s what I came up with for you today: a cute and sweet interactive shaker card. To start, I die cut the bear and a few different bees using Hey Honey SugarCuts. 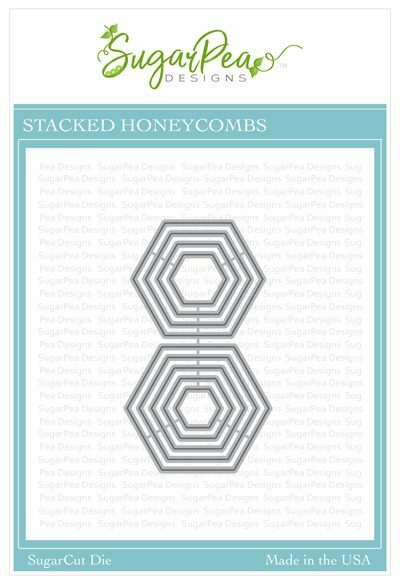 Next I aligned the negative parts of the dies into my MISTI stamping tool and stamped the coordinating images from Hey Honey stamp set. Instead of proceeding with a regular coloring, I quickly inked the bear using Vintage Photo Distress ink and only colored the bees’ wings with B000 and B01 Copic markers. For the shaker part, I used Zig Zag Stitched Circles SugarCut paired with new Honeycomb Cover Plate. I inked once more the inside of the shaker window with a yellow ink this time and filled it with golden/yellow sequins and beads. Finally I decided to add a few colorful elements: a bright pink heart die cut from the same Hey Honey SugarCut set and the matching sentiment banner both colors with RV04 Copic marker. The dotted card front is a little sneak peek on what is coming up tomorrow. So stay tuned!!! 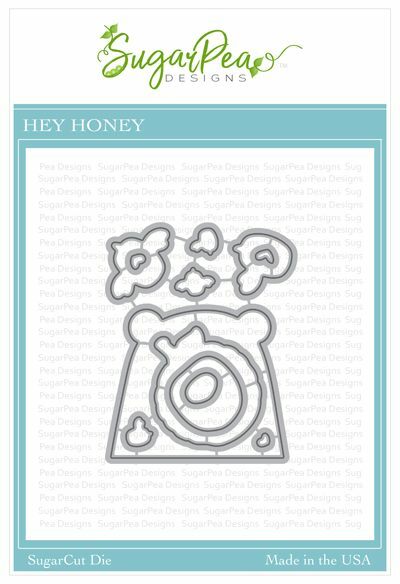 Would you like to win the Hey Honey stamp set? Leave a comment below.